Requests for academic or administrative meetings or events space may be accommodated by a reservation of the Class of 1941 Lecture Room. Whenever possible, the Library would like to collaborate with the group requesting use of the room for an event. The Library does not offer space to be scheduled for regular class meetings; contact the registrar’s office for appropriate classroom space. Reservation requests are encouraged at least four weeks in advance, but not more than six months out. There is a $200.00 charge per day for using the Class of 1941 Lecture Room whenever Library staff is not involved in the meeting or event. This payment must be sent by journal voucher two days after reserving the room. 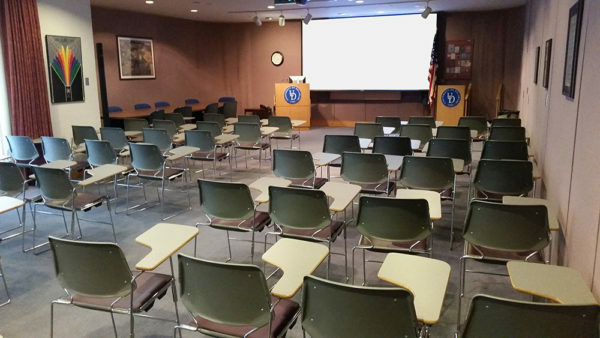 To check availability and to reserve the Class of 1941 Lecture Room for an event, please contact Vicky White, Events Manager, at 302-831-6250 or vickyw@udel.edu. If you are unable to reach Vicky, you can contact Shelly McCoy, Associate University Librarian for Communication and Space Planning, at 302-831-6363 or smccoy@udel.edu. You are encouraged to make an appointment to see the space to ensure that it will meet your needs. An event should not be advertised until you receive confirmation of your reservation. The Class of 1941 Lecture Room can only be reserved for meetings/events that begin during hours the Library is open and must end one hour before the Library Circulation and Reserve Desk closes. If catering, AV or movers are used for the reservation, the event/meeting cannot start until the building has been open for at least one hour. When finished using the space, the room should be left the way you found it. If the room is found with trash that was not disposed of properly or damage that was not reported, the department requesting the reservation will be held responsible for replacement of damaged items and extra custodial services. Cancellation of a room reservation must be made at least ten business days prior to the date of the event in order to have the $200.00 room fee refunded. Cancellations received within nine business days of the event will not be eligible for a refund. If there are unforeseen circumstances that occur with the facility that will impact the ability to keep the room reservation, the Library will communicate this information as soon as possible and the room fee will be refunded. The Class of 1941 Lecture Room is the room located immediately inside the first set of glass doors to the Library, directly across from the Commons. The room can be accessed without having to go through the Library turnstiles. This room is routinely set in classroom style with approximately 56 chairs that have tablet arms. In the back of the room, additional chairs are stacked for use as needed, as well as a coat rack and two tables that can be used for refreshments, literature or name tag use. In the front left of the room is a large podium and a board table that seats eight. 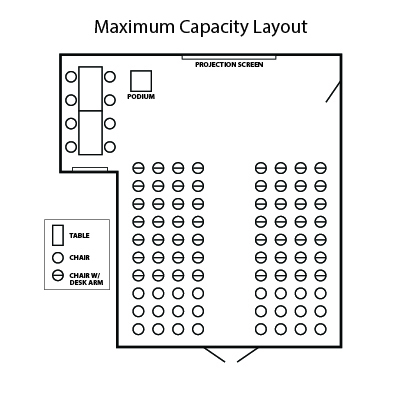 With two tables in the back of the room, the Lecture Room can fit approximately 70 chairs. Without the tables, it can fit approximately 80 chairs. There are pictures on the wall that cannot be removed for your event. If you would like to hang anything lightweight on the wall, you can use a tack to fasten it to the wall cloth, but please do not use tape on the windows. There is also an enclosed white board at the front of the room, which could be used as a location to tape posters (the white board cannot be used at the same time as the projector). There are three window treatments in the Lecture Room for both windows. The closest to the window is the black-out shade curtains, the middle curtains are the sheer curtains, and the inner-room curtains are the mauve color curtains. There are three pull cords for each set of curtains on the side. If you are thinking about using signage/posters just outside the entrance of the Lecture Room, please request use of our wooden easel. The pegs of the easel are adjustable, but the sign must be at least 16” wide. 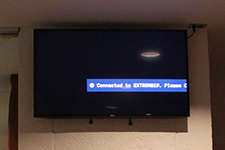 Library display monitors cannot be used for events that do not involve the Library. Vicky White, Events Manager, can arrange for UD movers and University of Delaware Catering. Please contact her at 831-6250 or vickyw@udel.edu. The same JV information used for the room cost will be used to cover these expenses. 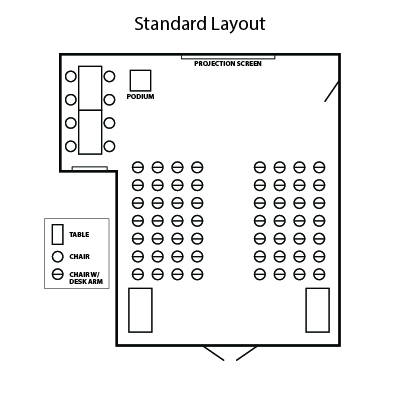 Most catering events held in the Lecture Room are with Service Type 1, which means you/we are responsible for cleaning up the refreshments following the event. The two small tables or the long board table can be used for refreshments. There is a projector connected to a computer, an HDMI connection for laptops and a handheld wireless microphone in a stand at the podium at the front of the room. Audio from the microphone and from the computer plays through the PA speakers in the room. Volume is controlled via the control panel on the wall at the front of the room. An external DVD drive for connection to a computer or laptop is available if requested in advance. 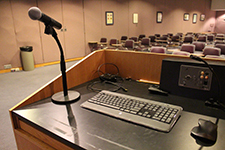 Any presenters using this equipment or connection should arrive at least a half hour before the event to connect his or her laptop, load his or her presentation on the computer in the room and to test his or her presentation with the audio equipment. 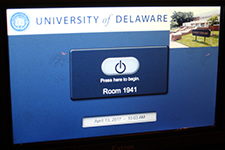 Remember that if the speaker is from outside of UD and does not have an existing eduroam account from another .edu institution, a guest Wi-Fi connection may need to be set up. The guest connection is only valid for 24 hours. If an event is open to the greater community, advise your audience that Pay to Park facilities are available in the Visitors’ Lot #41 on South College Avenue, the Trabant University Center Garage on Main Street, the Perkins Student Center Garage on Academy Street and the Center for the Arts Garage on Amstel Avenue. Hourly parkers will pay the kiosk upon arrival using their vehicle license plate. The PassPort app is also available for each location. Arrive at least an hour prior to the start of the event to check room and AV setups and ensure catering is as expected. Go to the Circulation Desk located on the left hand side when entering through the turnstiles, etc. The Circulation Desk is aware of reservations and will let you into the room when you arrive. If you have to leave the room for any reason or your meeting/event ends early, notify the Circulation Desk to lock the door. There are two light controllers. One on the left when users enter the room and one on the right at the front of the room. There is a main on/off switch on both controllers and dimmer sliders to control the brightness of the lights. If anything is damaged in the room or the room is not clean, please report this to Vicky White, 302-831-6250, so that we can rectify the matter prior to the start of the event, if possible. There is an “event in progress” sign inside the room that you may put outside the room, if desired, before the event/meeting begins and returned inside the room when the meeting/event is completed. Use of this sign is optional. Sometimes the sign helps reduce the noise just outside the room. There is a telephone located in the front of the room on a small table behind the podium. The telephone may be unplugged during the event and plugged in after the event. The phone number for the Class of 1941 Lecture Room is 302-831-6520. The large podium, which includes a computer for projections, a microphone and a reading light, is on wheels. You may lock the wheels, if desired, to avoid having the podium move during a meeting/event. The person responsible for the event should plan to remain in the room during the event. If catering is involved, the person responsible should be there for setup and for clean-up. All food, edibles and paper tablecloths should be thrown in the trash in the Lecture Room. If linen tablecloths, coffee carafes or plastic pitchers were used from UD Catering, give them to Vicky White to return to Dining Services. If your event is on a Saturday or Sunday, please take the trash with you and dispose of it in the trash dumpster near the Library loading dock. If only a couple of chairs were moved and UD Movers were not used, restore the room to classroom fashion. Before leaving, the “event in progress” sign and/or easel should be brought back into the room. Also remember to turn off the AV system, turn off the light and return any adapters to the Circulation Desk and notify them to lock the door. 1. Connect the laptop to the wireless HDMI module. This is a 3” by 3” black box with a power cable and blue LED, found on top of the podium (pictured at right). 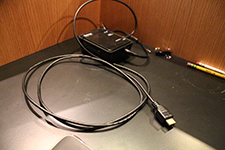 Note: If you are using a device that does not have an HDMI connection and you do not have your own adapters with you, a selection of adapters are kept at the Circulation Desk. 2. Behind the podium on the wall is the AV control panel. Tap the power button, which reads “Press here to begin” on the AV control panel. Note: The panel is motion activated. Walking in front of the panel will activate it. 6” by 7” black rectangular box mounted on the wall below the touch panel—and select Wall Plate instead of Wireless HDMI. 4. The projector and display monitor, which are to the right and on the wall in front of the podium, will both power on. The screen, which is behind the podium, will drop from the ceiling. 5. 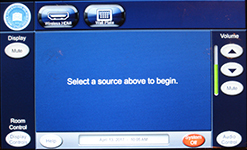 Adjust the main sound volume by using the volume controls on the right side of the AV control panel. Note: The small speakers in the ceiling will make it difficult to tell from the front if the volume is high enough. To check, you will need to have someone in the back of the room when testing the sound. 6. When finished, power off the system by tapping the red System Off button on the control panel, and confirm by tapping the green Power Off button. 7. 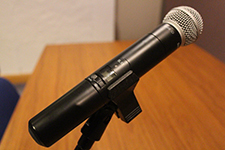 If the microphone was used, please power it down by holding the power button on the microphone until the power LED goes out.